My husband lost his wedding band many years ago, and had been tanning his ring finger ever since. He was never much of a ring wearer, and wasn’t particularly fond of his wedding ring because it had a flat section that was supposed to sit front and centre – but it always shifted on him. He loved the idea of a new ring made by me – as long as it wasn’t too wide, and as long as it was the same all the way around, so it wouldn’t matter if it moved around on his finger. We settled on a banded ring design with a hammered, antiqued finish – something that would look best when it wasn’t all shiny and polished, because he works a lot with his hands. 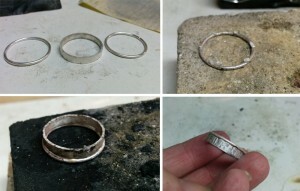 I made this ring quite a while ago, when my sawing skills weren’t well practiced. Bit of a crooked line there, but I fixed that up no problem with a lot of filing and sanding. 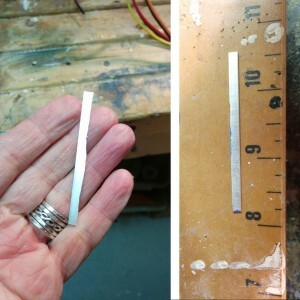 The second photo is a composite of photos that shows the 3 components of the ring… a flat, textured band for the middle component, with 2 narrow round bands for the outer edges, along with some pictures of the process of getting one of the outer bands soldered to the middle band. I’d never done anything like this before, so it was a challenge to get the outer bands just the right size to fit with the middle component. But a bit of textured hammering on the outer bands saved the day – metal stretches a bit when you hammer it. 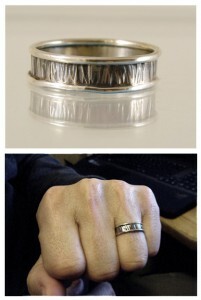 Plus, the texture was going to work well with the purposeful aged look of the ring. The other tricky part about soldering on the 2 outer bands was getting them totally centered on the middle band. Things tend to shift a bit when you’re soldering. When the soldering steps were complete, there was a big clean-up step. Lots of polishing. It looked rather nice shiny. But of course, that wasn’t the look I was going for. The next step was to apply a liver of sulfur patina, which darkens it. Darkens the whole ring to a near black, which I then had to polish off, leaving the patina in just the nooks and crannies. Here’s the finished ring. He loves it. And I love that he loves it.